We all look forward to the typical burgers, brats, and hotdogs that get grilled when we’re camping. They have been favorites for years and a camping trip wouldn’t be complete without them. When we think of adding fruits and veggies to our camping meals it often ends up being cut up veggies with a heavy ranch dip or fruit sections with a cream cheese dip. They are tasty and enjoyable but not very creative. 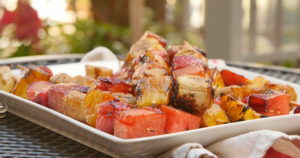 You can ramp up your flavor and nutrition profile when you’re camping by exploring some of the tasty recipes for grilled fruit kabobs. You can choose to use the fruit that is recommended below or choose other fruits that are your favorites. Once they hit the grill and begin to caramelize those flavors are turned up and you won’t be able to resist. These are made with pineapple, watermelon, bananas, and strawberries. They are drizzled with a honey/balsamic vinegar glaze. Incredibly delicious. Be sure to make more than you think you’ll need because your campers will be coming back for seconds. For these you can cut up chunks of peaches, pineapple, and bananas. The glaze is made with maple syrup, cumin, cinnamon, and cayenne pepper. Doesn’t that sound delicious! Sweet and tangy with a little bit of heat all blending with the grilled goodness of the fruit. Cut the fruit into good sized chunks. It will keep them on the skewers. Use wooden skewers and soak them in water before putting them on the grill. Use a basting brush to glaze the fruit. It will provide a light, even coating. Keep your eye on these and turn when they begin to caramelize. They can burn quickly. We know that food is a central part of your camping experience. These recipes will give you new tastes and techniques to try on your next camping trip.